1 Samuel is the story of battles and murders, schemes and betrayals, and shepherds and giants. It is also the history of what happened when God gave his people the king they wanted, and then gave his people the king they needed. And through it all, it paints a wonderful picture of the ultimate King God has chosen for his people, his Son Jesus. With his trademark insight and clarity, Tim Chester unpacks this part of the Old Testament for small groups, enabling them to appreciate Jesus' rule for his people, and to see how to live as his subjects today. 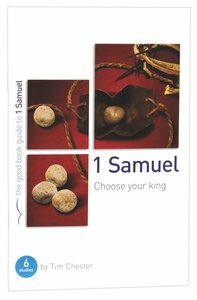 About "1 Samuel: Choose Your King (The Good Book Guides Series)"
Dr Tim Chester is the pastor of Grace Church in Boroughbridge, North Yorkshire, UK, and is a faculty member at The Acts 29 Oak Hill Academy. He is part of the Crowded House, a church planting initiative in Sheffield, UK, and is founder and co-director of the Porterbrook Seminary, a college-level theological training and ministry institute. He was previously Research and Policy Director for Tearfund and tutor in missiology at Cliff College. Tim is the author of over thirty books of theology and history, ranging from the popular to the specialised, including Mission and the Coming of God: Eschatology, the Trinity and Mission in the Theology of Jurgen Moltmann (Paternoster); The Message of Prayer (Inter-Varsity Press); From Creation to New Creation (Paternoster); Good News to the Poor (Inter-Varsity Press); Delighting in the Trinity (Monarch); The Busy Christians Guide to Busyness (Inter-Varsity Press); and You can change: God's transforming power for our sinful behaviour and negative emotions (Inter-Varsity Press). Tim is co-author of The Gospel-Centered Church (The Good Book Co), The World We All Want (Authentic) and Total Church (Inter-Varsity Press) and series editor of The Good Book Guides. Tim is married to Helen, and they have two daughters. These flexible, practical guides have been developed to help ordinary Christians engage directly with Scripture. Not only does each guide uncover the meaning of a passage and relate it to the Bible's big picture; it also leads users to apply what they have learned in their lives. User-friendly and Christ-centred!